Love them or hate them, selfies are here to stay. A photographic staple not only for social media addicts, but also for the majority of modern day travelers and partygoers, selfies are now the most accepted – and expected – way to capture your escapades. However even the most proficient of selfie-takers faces the same problem in dim lighting…risk an ugly flash, or have no record at all of your adventures. What a dilemma! The iGlo selfie case fixes the problem of night time photography, allowing the user to take selfies not only in dim lighting such as at bars and nightclubs, but even just by the light of the moon! The warm LED lights come with a dimmer feature so you can choose your perfect level of lighting, creating a flattering hue for stunning night-time selfies that's impossible to achieve with a standard phone camera flash. And as an added bonus, the iGlo lights can even kick into disco mode to really get your photo party started – or just to help your friends find you in a dark room! 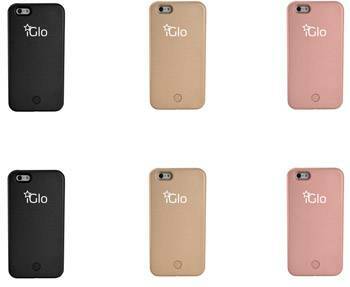 Compatible with the iPhone charger, the iGlo selfie case is light, portable, and easily the most user-friendly light-up case on the market. Perfected for the Australian selfie addict by self-confessed selfie queen Serena de Comarmond, the iGlo solves a problem that she acknowledges is a bit of a laugh, but also one that is also becoming a universal. 'As a selfie addict, I can openly admit to feeling photographically defeated at night," Serena laughs. 'The options of light up cases available internationally are too bulky, too expensive, and require a totally separate charging system. I figured there had to be an easier way to make perfect night time selfies a reality for all the selfie addicts like me out there!"